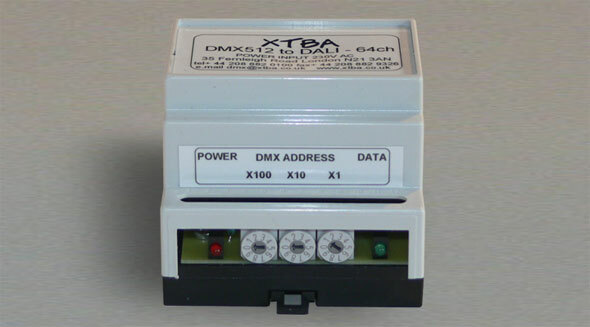 The XTBA DMX to DALI 64 channel converter (Now RDM compatible) offers a one to one level conversion between DMX and DALI .The start address of the 64 DMX channels to be converted is set from the PCB mount code switches. 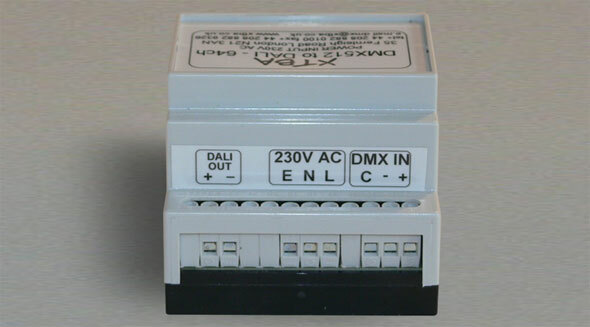 In addition as DALI ballasts do not have address switches they need to be programmed. The XTBA card can be set up to program the ballast's address. As DALI is relatively slow the DALI data length can be shortened on the XTBA card between 64 to 1. Half the number of channels sent = double the speed. The unit also has a user selectable output curve to improve the fade profile. The unit will also drive the DALI ballasts direct without the need of an additional DALI power supply. 4 DIN Module, Power & Data LEDs, DMX address switches, ballast programmer. 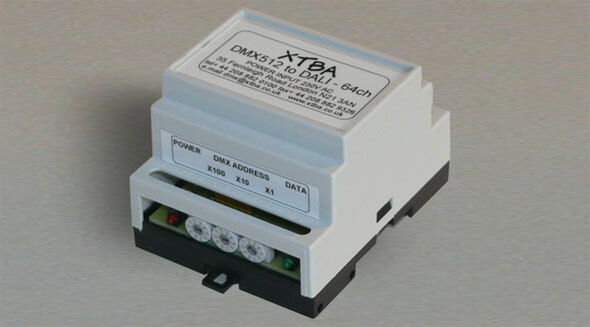 The XTBA DMX to DALI 64D can be supplied (on request) with an additional external switch input. The switch allows the DALI output to be controlled from a switch in the event of DMX loss. This may be useful if the converter is used to control house lights in an installation. Using the switch the house lights can be controlled without the need for the main lighting control to be turned on. The unit can convert DMX to DALI channels (as before) or the unit can be set to convert DMX to 16 DALI groups. Local test mode will support channels or groups making for simple installation testing. The unit can be supplied for use with an external power supply to allow for installations where more than 80 DALI fixtures are required. Hold last frame on DMX loss has been added as an option. An ‘emergency mode’ option has been added which will send all fixtures to a user set level in the event of DMX loss. A free upgrade is available for all existing users of versions prior to V68 - please request yours by email or call us.